Located in the south-west of Mayfair in London’s West End, Berkeley Square was originally laid out by architect William Kent in the mid 1700s. It takes its name from the Berkeley family of Gloucestershire (the first Lord Berkeley of Stratton was a Royalist commander in the Civil War) whose London residence, Berkeley House, stood on what is now the south side of the square until it was destroyed in a fire in 1733 (Devonshire House, whose residents included the 5th Earl of Devonshire and his somewhat notorious wife Georgiana, was subsequently built on the site and remained there until it was demolished in the 1920s). The gardens, which feature some of the city’s oldest London Plane trees (dating from 1789), have a pump house at the centre which was built in 1800 and is now Grade II listed (it stands on the site of an earlier equestrian statue of King George III). Other features including the statue Lady of Sumaria (Water Carrier) – pictured above – which was made by Pre-Raphaelite sculptor Alexander Munro in 1858 and stands at the garden’s southern end. Among notable buildings which face onto the square are Lansdowne House – located on the south-west corner of the square, it was designed by Robert Adam and now home of the Lansdowne Club – and number 50 Berkeley Square, home of short-lived early 19th century PM George Canning (and said to be the most haunted house in London). The square was also the home of society favorite, Gunter’s Tea Shop, which dated from the mid-1700s. Famous residents have included wartime PM Sir Winston Church (he lived at number 48 as a child); Horace Walpole, some of the first Prime Minister Robert Walpole (he lived at number 11 during the 1700s), Robert Clive (more famously known as Clive of India, he committed suicide in number 45 in 1774), and the fictional Bertie Wooster and his valet Jeeves (creations of author PG Wodehouse). 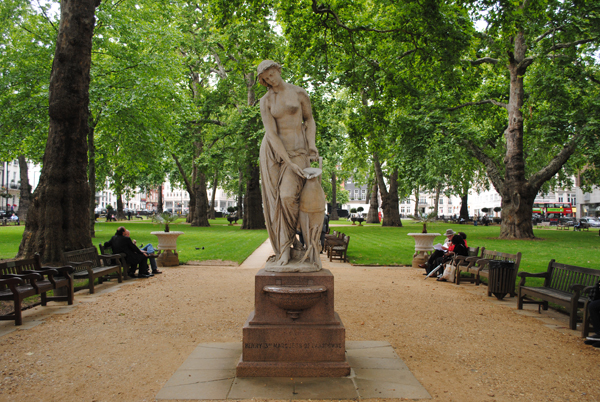 The square also featured in the famous wartime song, A Nightingale Sang in Berkeley Square. The square is open from 8am daily with closing times varying based on the season. Now you are talking my language! If I lived in the centre of London and had endless money, I would definitely live on one of the gorgeous squares.. It was abandoned by family due to financial troubles (in particular death duties) and bought by developers…Sad tale of too many buildings in London and other cities around the world. Thankfully attitudes have changed – somewhat, anyway!